It has been pointed out to me by several people that most GDPR experts ARE recommending that we take specific action with regards to our existing list. May 7, 2018 Update: There’s a COOL deal on Appsumo right now for a nice looking “GDPR Tracker.” Might be worth checking out for $49. 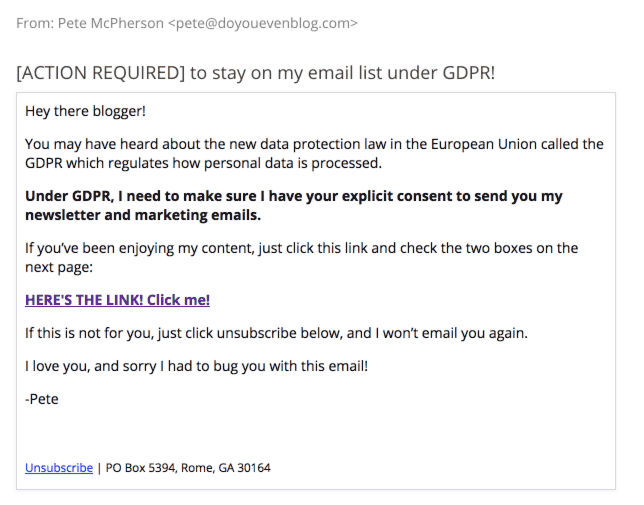 May 24, 2018 Update: I just sent my GDPR consent email to my subscribers via ConvertKit, see below! This was incredibly easy, as ConvertKit now has a feature to locate/segment/tag your EU subscribers! The link uses that “liquid” code above. Pete McPherson cannot be held liable for anything you do. I am NOT a lawyer or a GDPR expert, nor do I pretend to be one on the internet. The following is simply a summary of my findings on the subject. Consult with an attorney for your business for proper legal advice. To be frank, the topic of GDPR is boring as all get out (and apparently “all get out” is a lot so I’m told). Just boil things down in plain english for this post. You cool with that? I thought so. The General Data Protection Regulation (GDPR) is a digital privacy regulation being introduced on the 25th May, 2018. It standardizes a wide range of different privacy legislation’s across the EU into one central set of regulations that will protect users in all member states. Anybody who collects data from people living in the EU needs to put in place more privacy settings. Furthermore, this isn’t “suggestion,” this is LEGALLY BINDING stuff…meaning if you don’t take certain measures to comply, you’ll be doing illegal things. 1 – Does GDPR apply to bloggers who mainly write for non-European audiences? Actually, it applies to ANYONE who will have EU people on their email list! Doesn’t matter the audience you write for…if you have EU folks opting in…this GDPR stuff is for you. 2 – What do I need to DO to be compliant for GDPR before May 25? Make sure your INTENTIONS are explicitly clear on ALL your opt-in forms and landing pages. For now, that’s your only to-do list. Anybody who uses your opt-in forms should KNOW what they’re getting themselves into, and you need to tell them! Example: If they’re signing up for a free PDF, and they will ALSO be added to regular email communications…you’ll need to make that clear before they opt-in! Add a sentence like “You’re opting in the weekly Do You Even Blog newsletter!” or something like that. Add this language to your double opt-in confirmation email. If you don’t want to add it to the forms, you can use language like this in a double opt-in email. Make it clear what they’re actually signing up for. That’s all. HUGE UPDATE: My friend Ross works on GDPR, and corrected me on this! From the ICO, “Avoid making consent to processing a precondition of a service”. We’ve been told that we can’t make signing up to a mailing list a requirement to receive something (a free PDF, a discount coupon, access to a course/site or whatever). Requiring someone to receive an emails they may not want in order to receive a book/coupon/whatever that they do, is apparently not OK. It’s a massive pain as everyone does this. 4 – I use [fill-in-the-blank] email marketing platform, what do I need to do? Here is the ConvertKit article detailing how they’re complying, and a full feature list! For now, just make sure the “intention” thing is clear, then go enable this! Here is a blog post from MC explaining all their new GDPR tools! Here is Drip’s article and guide 🙂, and here is Aweber. 5 – Do I need to RESEND opt-ins or a confirmation email to my existing list? In general, no. You do not. If you can’t show evidence people gave clear consent to receive your crap, they’re not valid. You don’t need to just have got their permission, you also need to be able to demonstrate it. We’re being told that any email list that wasn’t double opt-in and, thus we can not prove they have opted in on purpose, is not valid. The interpretation we’ve been given is that if you can’t show evidence of opt-in, it’s not valid. Submitting a form without explicitly checking a box saying you wanted to receive emails would not be considered opting in, and without the double opt-in it’s hard to see how you could ever prove this. If you’ve ever moved mailing providers this becomes harder still, as there is a good chance that data like that wouldn’t come over. Send a “reengagement” campaign to the EU people to get their explicit consent. If it sounds really annoying, that’s because it is. 6- If we are brand new, does GDPR have impact on us? Or does it really only matter once you are selling products? If you plan on letting anybody from the EU subscribe to your stuff, it matters. Age doesn’t. Products doesn’t. (However, if people are getting on your email list via buying a product, you need to make your intent clear! Tell them they’re ALSO getting on the regular newsletter! 7 – What if I’m collecting peoples’ data in another way (outside an email marketing list)? This particular article is geared towards email marketers and bloggers who open their communications to people in the EU. That’s it. But in general, the GDPR laws DO apply to tons of other ways that we interact with people in the EU…and their data. This could be contact forms on your website, or even a comments plug-in (*COUGH Disqus). 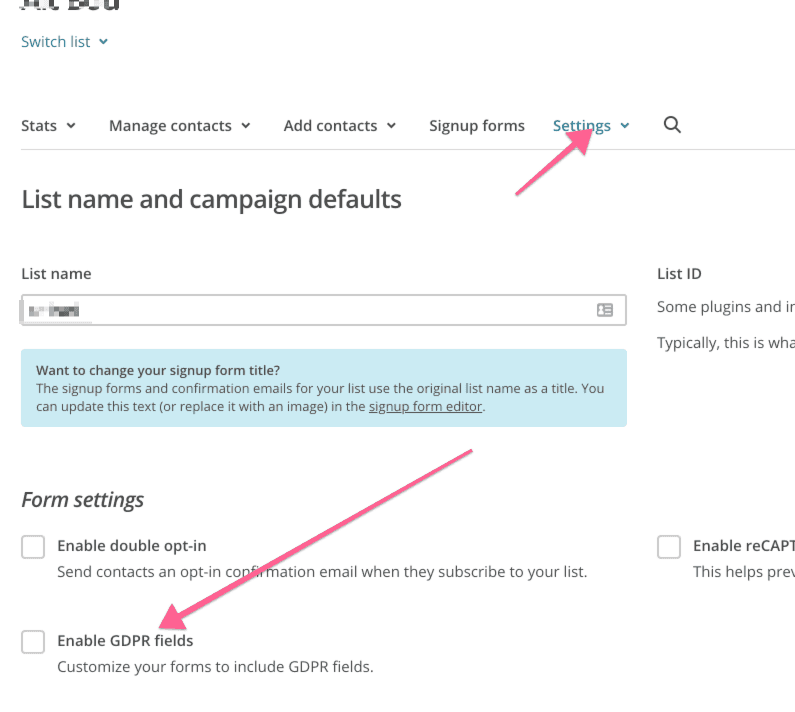 1 – Go to your ESP and enable GDPR compliant forms! It’s so simple. No reason not to do it. 2 – Make sure you’re clear to any potential subscribers WHAT they’re getting themselves into. Here’s what I’m doing, personally. Next, I am updating ALL of my landing pages and forms to be double opt-in, and reworking my confirmation email to be explicitly clear what subscribers are signing up for. I’m witty and snarky, so the email copy won’t dissuade people from joining (at least not from a GDPR standpoint. They may because I’m witty and snarky). That’s pretty much all bloggers need to know about GDPR Compliance. We’re not spammy digital marketers. We know you get a ton of blogging newsletters already. We’ll be emailing about once a week, with very few sales, if ever. By opting in here, you agree to receive SINCERE, transparent, value-adding, non-spammy, exclusive content that WILL 110% help you grow your blog. We’re fired-up about blogging, and our emails won’t disappoint. This is very helpful, thanks Pete! I heard about it and was starting to research it on my own, but I appreciate that you’ve given me the info to make the change easier. This was very informational, Pete! Thank you for compiling it! I’ve been trying to decipher what exactly needs to be done, and you’ve made it very clear and easy when I thought it was more complicated. In the same vein, Google 360 has sent me an email about GDPR and I think what it’s saying (in the most complicated way possible) is that I need to agree to their new data processing terms and give my contact info. Does that sound about right? I have been hit with soooo many of those “agree to our new stuff” prompts as well. I’m no expert on Google 360, but I’ve personally just been casually saying “I agree.” Not sure if that’s good or bad. This was so helpful but I’m not sure what you mean by enable my Convertkit forms. Can you explain that? Go to your account and “enable” the GDPR additional checkboxes option. Hope that helps? Hi Pete, great video, thank you so much. One question- do we not need to add one of those cookie pop ups on our site? I thought we had to for GDPR but hopefully I am wrong. Hmm. I can’t say for certain, but I definitely haven’t seen that at all in my research! That is a bit silly and specific of an EU law, they must not have enough problems ? I started putting my unsubscribe link at the top of the email like you did Pete. Great idea, super convenient for people who had enough. I think they should just make unsubscribe link first on top mandatory, not this whole opt in & prove it nonsense. hahaha that’s EXACTLY what I first thought when I heard about this. And I actually totally agree. I think unsubscribing should be handled by Outlook, Gmail, Apple Mail, etc. COMPLETELY. I.e. give companies zero control over this, and put it in the hands of the users. Just me though apparently. So if I were to have a freebie + add someone to my mailing list, do I need to have a checkbox for people to click to opt in to my additional emails? Or is a sentence saying that they will get additional emails is enough? Thank you! If people are just giving me names and email addresses, how do I know if they’re from the EU? Do I need to send an email to ALL my subscribers to re subscribe just in case? It’s a bit unclear for most email platforms right now. As of May 2018, I think they’ve all STATED that they’ll be adding features that can pick out which of your subs are from the EU (using IP addresses I think). ConvertKit has definitely said as much, but as of today it’s not implemented yet.